Pohnpei—The highly anticipated first screening of the documentary “Island Soldier” took place at the Pohnpei Center Cinemas this afternoon with the support of the US Embassy to the FSM in conjunction with the 25th anniversary of the College of Micronesia FSM. 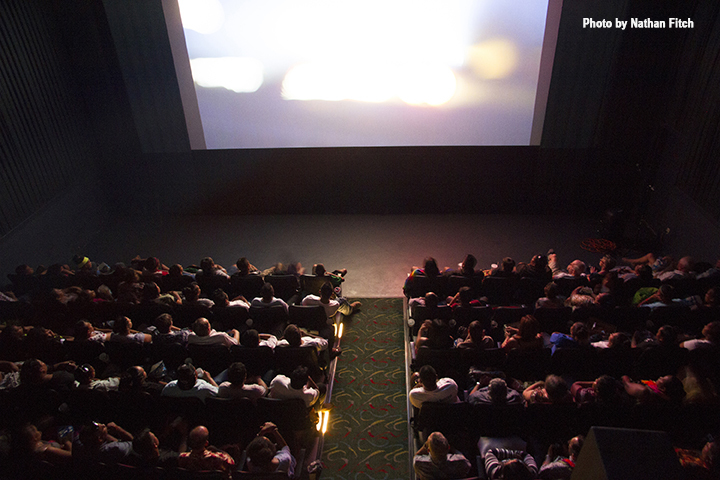 Pohnpei Center Cinemas has three theaters. The documentary was displayed in all three of the theaters. Each was full to above capacity. Writer, producer, and videographer Nathan Fitch served as a US Peace Corps volunteer for two years and also lived in Pohnpei for six months. He said during the question and answer session after the screening that it was because of the relationships and trust he established during that time that he was allowed access to do the documentary. He said that when he returned to his home in New York he found it a bit difficult to readjust to the completely different life there, the life he’d grown up with. Micronesia had inexorably changed him as it has a tendency to do for those who let it. He found that most people in the US had never heard of the FSM. Worse, when he tried to tell them about his experiences here they didn’t seem to care. He said that in some ways, “Island Soldier” was an excuse to come back to the FSM, but it was also an attempt to perhaps make them care. The documentary ultimately went in a direction that he didn’t initially intend. He had set out to educate people about the fact that under the Compact of Free Association with the United States, people in the FSM can serve in the US military. On a per capita basis, more people in the FSM choose to enlist than do in the United States. He wanted to explore the various motivations for enlistment that range from the problem of high unemployment and low wages through to a feeling of thankfulness to the US for liberating the FSM at the end of World War II, ultimately leading to the establishment of a new sovereign nation. 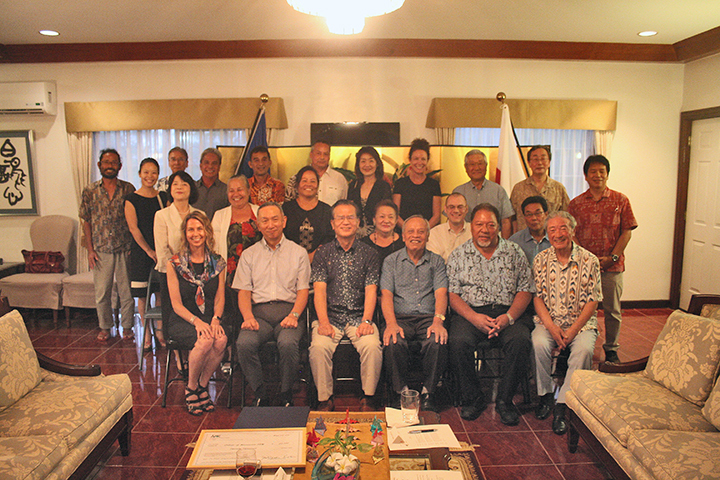 On March 21st, 2018，His Excellency Mr. Ryoichi Horie, Ambassador of Japan to the FSM, held a celebration party for commendation to College of Micronesia-FSM (COM-FSM) at his residence. The Hon. 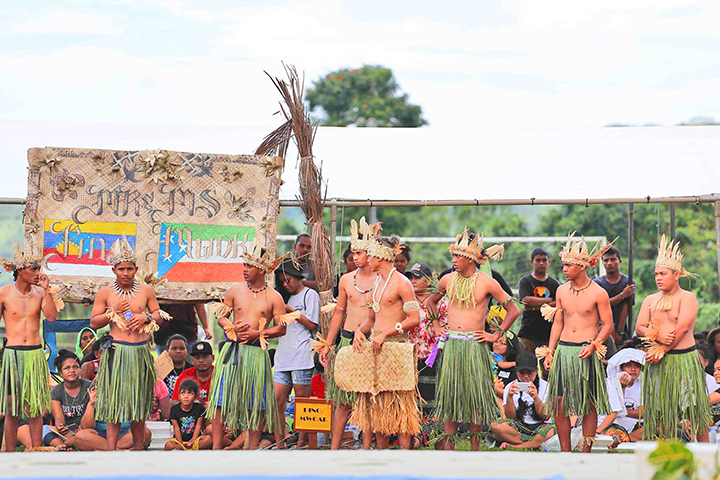 Yosiwo P. George, the vice president of the Federated States of Micronesia, attended as the chief guest. Ambassador Horie awarded a certificate of commendation along with a handcrafted wooden plaque to COM-FSM in recognition of their distinguished contributions to deepen friendship between Japan and the FSM through a variety of student exchange programs with many different Japanese universities and Japanese language classes by JICA volunteers and Ms. Kamikubo, the associate professor of COM-FSM since its foundation. The Hon. Joseph J. Urusemal, a member of 19th Congress of the FSM provided the congratulatory remarks and Dr. Frankie Harris, the acting president of COM-FSM accepted the award and expressed thanks and gratitude on behalf of COM-FSM. In addition to the commendation ceremony, following three events were also taken place. ・Basic agreement signing ceremony among APIC (Association for Promotion of International Cooperation) and Sophia University and Micronesia Conservation Trust (MCT) to foster human resources who will be able to address environmental issues in Micronesia. 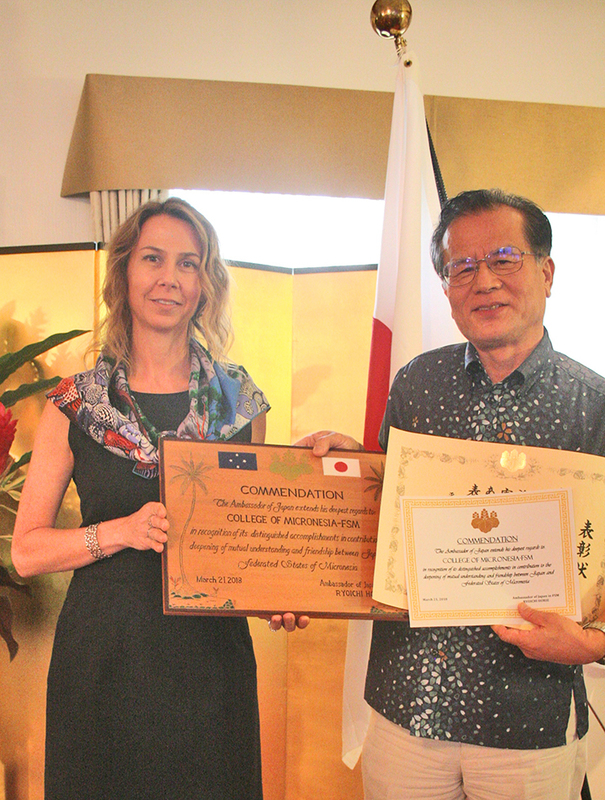 The Ambassador’s commendation is awarded to individuals or groups that have been making significant contributions to the promotion of friendship and mutual understanding between Japan and their own countries. COM-FSM is the second recipient in the FSM to receive this Commendation since 1988 when diplomatic relations between Japan and the FSM were established. The ceremonies were witnessed by the guests from the National and State governments, COM-FSM, Temple University Japan Campus, Sophia University, APIC, MCT and JICA and the Embassy staff. After almost a year of planning and consultation with stakeholders, community leaders for the Sapo, Oror, Ununo (SOU) area on Fefen Island endorse the first comprehensive Forest Stewardship Plan in Chuuk at a brief ceremony on March 4th that took place at the Sacred Heart Parish meeting hall on Fefen Island. 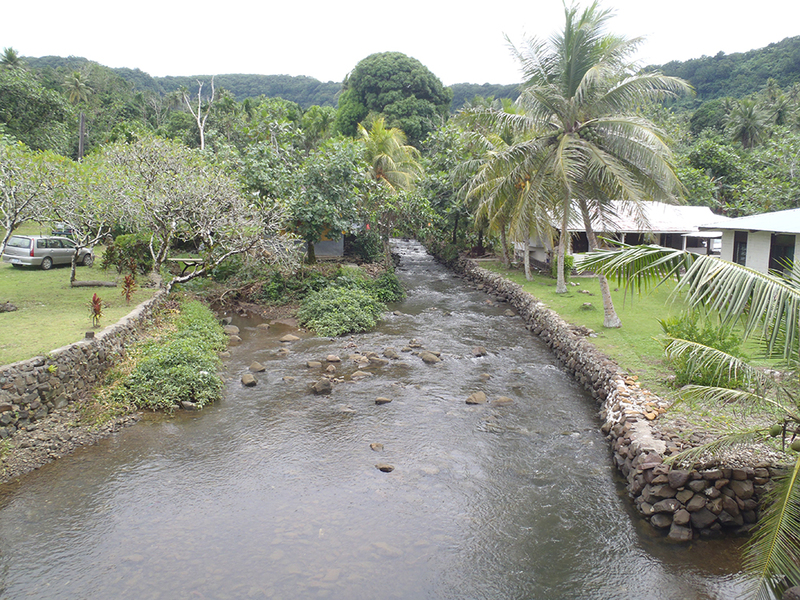 The small funding of a little over $10,000 for the project was provided by the United State Forest Service and managed by the Micronesia Conservation Trust team in Pohnpei, which subgranted part of that funds to the Chuuk Conservation Society to implement the project, subject to official approval by the Chuuk Department of Agriculture. Landowners in a designated forest management site have agreed to conserve and replant specific big trees, most especially the native plants facing threat in Chuuk, such as the Eeme tree (Cynometra yokotai), Perfume Flower plant (Fagraea berteriana), and the big Aaw tree (Ficus trukensis). The site includes varied habitats covering coastal vegetation, marshland swamp and taro patches, and upland forest critical to the protection of animal species including the threatened birds, such as the fruit bat and the endemic Chuuk Monarch. The SOU forest management endeavor is a long term community partnership with the view to assist owners not only by conserving resources but also in seeking for financial and technical support to food crop growers and gardeners whose properties fall in the management site. Stakeholders have agreed to allow the SOU Conservation Society to serve as the implementing agent of the plan acting on behalf of owners in relating to government entities, outside partners, and service providers. As early actions, owners identify the need to conduct stock assessment surveys for coconut tree, breadfruit tree, mangrove forest, and big trees such as mahogany, Alexandrian Laurel, and Ivory Palm. Assessment of watershed and shoreline areas claimed to have been affected by shipwreck oil spill are also prioritized as early actions within the first three years. During the signing ceremony, Fr. Fernando Titus, pastor of the Catholic Church on Fefen Island praised the stewardship plan as a “responsible community project” and encourage other villages to consider doing the same in the near future. Mr. Benisio Joseph has been chosen the interim chairperson for the SOU Conservation Society to lead the initial administrative matters and set the stage for early action implementation. The management site covers over 80 hectares which includes land resources identified through the FSM “blueprint” of biological resources tagged as areas of Biological Significance (ABS) for conservation work in 2002. The blueprint contributes to the creation of the FSM National Biodiversity Strategic Action Plan (NBSAP), whose major goal is to protect and sustainably manage significant marine, freshwater, and terrestrial ecosystems in the FSM. Chuuk State Department of Agriculture Director Kantito Kanas, who endorses the stewardship plan on behalf of the Chuuk State Government, hails the collaboration effort as a “big step in meeting Chuuk’s commitment to forest protection in the Micronesia Challenge”. Now, the big challenge for the SOU Conservation Society and the entire UFO villages is to take sure steps in implementing necessary early actions and rallying broad stakeholders’ recognition and support of the plan. For further information, contact the Chuuk Conservation Society at 330-7227. Pohnpei, Federated States of Micronesia, April 4, 2018 – Vital FSM Petroleum Corporation (FSMPC) has implemented the second of three scheduled price increases for gasoline that became effective Tuesday, March 20, 2018. Pump prices in the FSM now parallel Guam and remain below the maximum benchmark. Proposed legislation changes in Guam may place an upwards pressure on FSM fuel prices in the future. Bill No. 257-34 (LS) was introduced on March 13, 2018 to the 34th Guam Legislature by Senator Telena Cruz Nelson, Senator Thomas C. Ada, and Senator Dennis G. Rodriguez, Jr., and goes into effect sixty (60) days after enactment. The Bill seeks to eliminate a three-decade long tax exemption on liquid fuel transshipped through the Port of Guam. The bill approximates thirty million (30M) gallons of liquid fuel are distributed from Guam throughout the Micronesian region on an annual basis, and proposes that elimination of this tax exemption will generate up to $4.5M in revenue for Guam. The FSMPC has had a fuel supply agreement with Mobil Oil Guam Incorporated (MOGI) since September 2013, which was awarded following an international bid and tender process. The MOGI proposal provided the best value-for-money at that time, and used a supply model that transshipped fuel products through Guam. Vital FSM Petroleum Corporation’s Board and Management express thanks to policy makers, customers and the people of the FSM for their continued support of the company. Pohnpei—When College of Micronesia FSM officials approached Joe and Ruri Ayuyu about the possibility of their purchasing an advertisement in the COM 25th Anniversary commemorative magazine, they didn’t hesitate for a moment. They immediately purchased a two page advertisement. The magazine is not only a tool for information on the college; proceeds from advertisements in the magazine went to this year’s endowment fund raising goal of $500,000. The Ayuyus, who had already owned two McDonald’s restaurants in Saipan recently purchased all eight of the McDonald’s restaurants in Guam. They closed two of those restaurants and are currently building another in a different location. They employ over 500 people, making them one of the largest employers in the region. They said that more and more new job applicants for their restaurants are from the FSM. Ruri is herself from Chuuk, which is where she met her future husband, who was at the time a young banker from Saipan. They said that though a remote distant goal might be to open a McDonald’s restaurant in Pohnpei, they are not currently on island to explore business opportunities. They said they decided to come so that they could support the College of Micronesia. They have spent the last few days relaxing and sight-seeing and said that they have enjoyed the kind treatment of the people of Pohnpei and the relaxing environment. Joe is a member of a very active Chamber of Commerce and Ruri is a Rotarian. They joined the Pohnpei Rotary club for their weekly meeting today. Joe said that the last time they were in Pohnpei was for then FSM President Manny Mori’s inauguration for his second time. He said that he immediately noticed an increase in Pohnpei vehicular traffic and a marked increase in development. “It looks like things are happening,” he said. The Ayuyus were very serious about their commitment to supporting the College of Micronesia FSM. At the fund raising gala dinner at the National Campus last evening, Joe took to the podium and announced that he had just decided to donate another $10,000 to the College and challenged others to do the same. Then he and his wife continued to bid generously for small symbolic items throughout the remainder of the evening. By the time the gala fundraising dinner was over, donors had pledged over $576,000 for the college’s endowment fund, smashing their $500,000 goal. YAP, Federated States of Micronesia (NNS) -- U.S. Navy Seabee divers from Underwater Construction Team (UCT) 2 uncovered a cannon and met with students at Yap Catholic High School ahead of Pacific Partnership 2018 in Yap, Federated States of Micronesia, March 14-15. Capable of providing inshore and underwater construction of ocean facilities, UCT 2 work closely with local government agencies including the State Police and Port Operations while connecting with the community through local events and school visits. "We inspect waterfront facilities, repair, provide depth chart of channel" provide training for local marine resource divers. They do job in future"
While conducting hydrographic surveys of the ocean floor around Colonia, Yap on Mar. 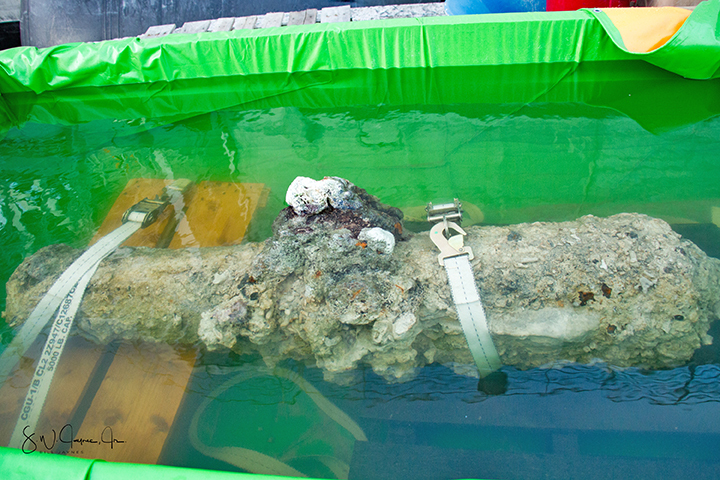 14, Chief Steelworker Jesse Hamblin spotted a cannon on the ocean floor. "We were in disbelief," said Hamblin. "Coming across an artifact that old and fragile, we knew it would be difficult to bring to the surface without damaging it." Referring back to salvage handbooks studied during the U.S. Navy's diver's course, Hospital Corpsman 1st Class Vernon Goodwin used barrel hitches of 55-gallon drums filled with air from available scuba tanks. 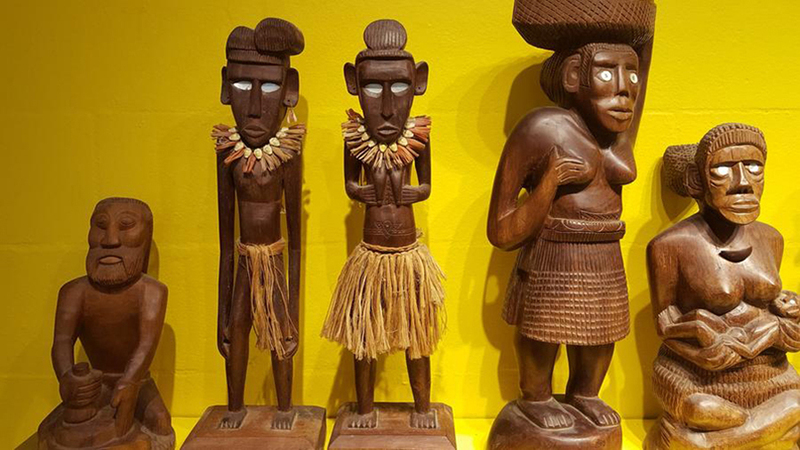 "We are honored to being part of discovering a little part of Yap's history, and we look forward to working with the local community to return this amazing artifact to the people of Yap," said Construction Electrician 2nd Class Tim Dailey. "We love what we do and welcome every opportunity to share our Navy story." UCT 2 met with more than thirty students at Yap Catholic High School on Mar. 14 to discuss life as a diver and being part of the U.S. Navy team. "It's amazing to interact with students who are engaged and interested in serving in the U.S. military," said Builder 2nd class Sean Mchugh. "It is truly inspiring to see the close relationship we have with Yap and the Federated States of Micronesia." 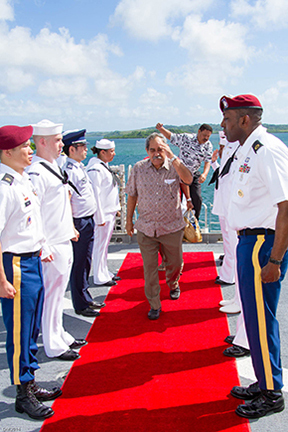 The U.S. and the Federated States of Micronesia continue a long history of friendship, having participated in the Pacific Partnership mission as host nation for five years with many Micronesian men and women having served or currently serving in the U.S. armed forces. UCT 2 will be supporting Pacific Partnership 2018 in Yap from Mar. 7 - Apr. 5. 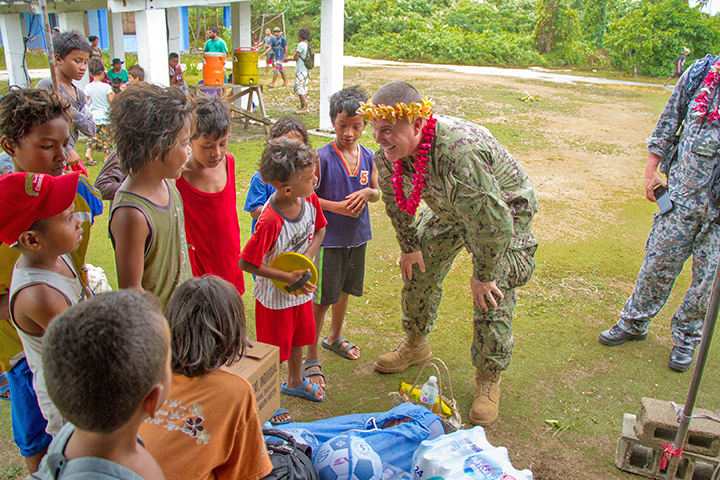 Pacific Partnership, now in its 13th iteration, is the largest annual multilateral humanitarian assistance and disaster relief preparedness mission conducted in the Indo-Pacific consisting of more than 800 U.S. and allied military personnel along with non-governmental organizations. 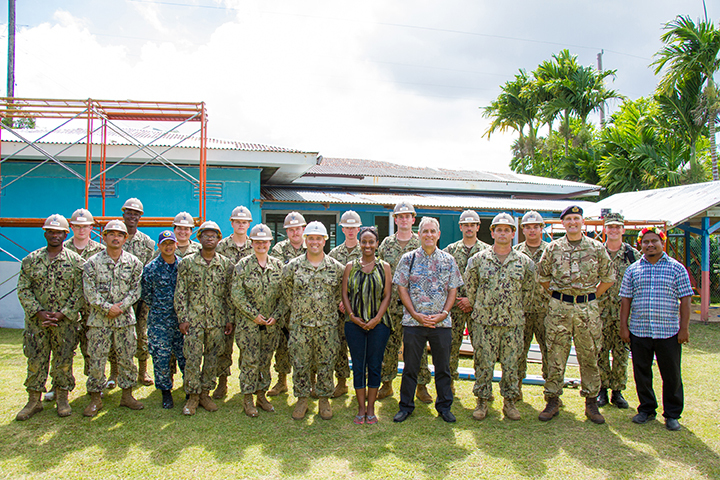 "We look forward to being part of the Pacific Partnership mission as we continue to participate in more community events and subject matter expert exchanges throughout the coming weeks," said Utilities Mate 2nd Class James Rieger. Palikir, Pohnpei—The College of Micronesia FSM held a dedication ceremony and demonstration of a new canoe and canoe house this morning. The Yapese community in Pohnpei and Yap student group built the canoe house by working on the Saturdays in February and March. Shaun Suliol, an employee at COM FSM was involved in the project and said that Xavior Yarofmal who is from Woleai and is a professor at the college was the master builder and foreman for the new canoe house. “It was a bit awkward building a canoe house in the middle of a mountain, but it’s a place of learning—an island classroom,” Suliol said. 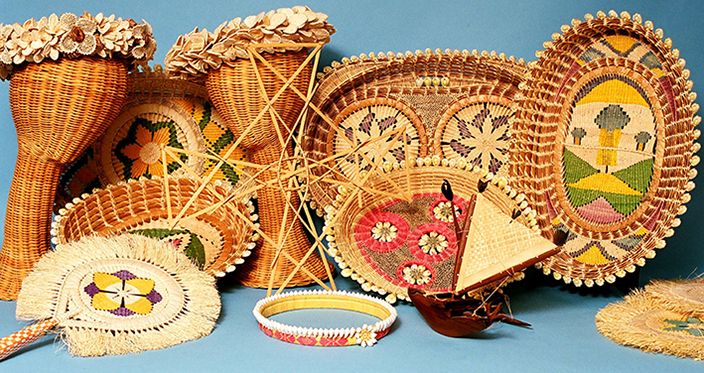 He said that materials were purchased from the Pohnpeian community. The wood came from Sekere and the thatch for the roof came from U and Kitti. He said they purchased local ropes from outer islands in Yap and Chuuk and that they used a total of approximately 3000 yards for the house. 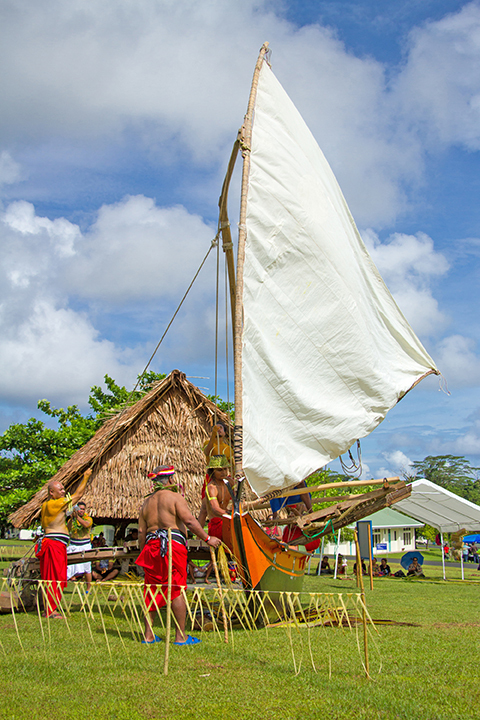 The canoe itself was sent to Pohnpei by modern transportation. It was made in Lamprek coordinated by Larry Raigetal and Joe Habuchmai. There was quite a bit of discussion about the name of the canoe house which is Weriyeng which, as Habuchmai informed the audience at the dedication means “Seen/see winds”, indicating that it can catch all winds or can catch wind from all directions. But it is also the name of one of the last two schools of traditional navigation. Mau Piailug was one of the most famous navigators of the school. Some wondered if it was an appropriate name for a canoe house in the middle of the COM FSM campus but ultimately the name stuck. Larry Raigetal was to have presented the canoe and canoe house at the ceremony but as he is preparing for a crossing from New Zealand to Yap by traditional navigation in the next few weeks, could not make it to Pohnpei. Instead Joe Habuchmai presented them in a less traditional style that Raigetal would have done but in an entertaining manner. 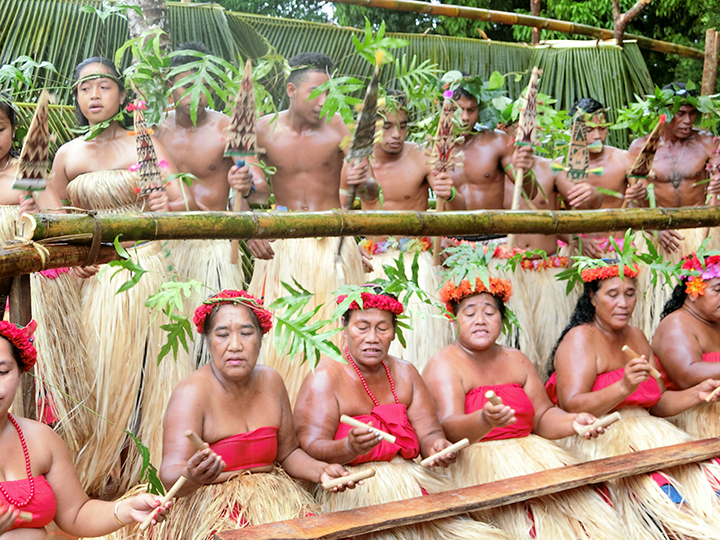 At his instruction, burly Yapese men pushed the canoe onto the lawn on a bed of coconut branches. The men demonstrated the various parts of the canoe and hoisted the sail. A fully traditional canoe would have a sail of woven pandanus. The sail on COMFSM’s canoe is of more modern material with the COMFSM seal in the middle of it. Even on land, the raising of the sail and the demonstration of “coming about” was a majestic site. 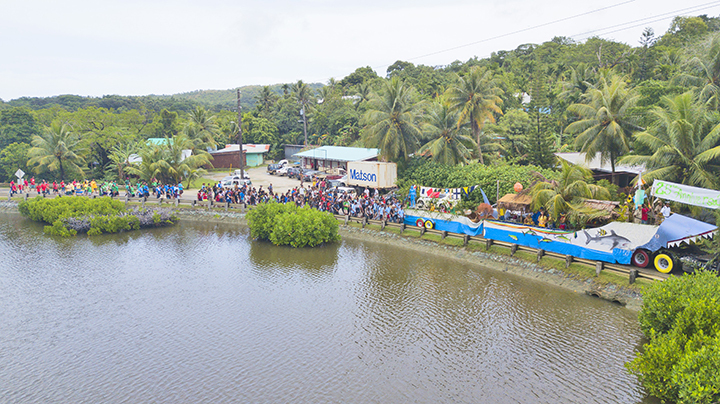 After the presentation of the canoe and canoe house, the crowd was invited to gather and take photos while the Yap student group finished preparations for traditional Yapese dance. 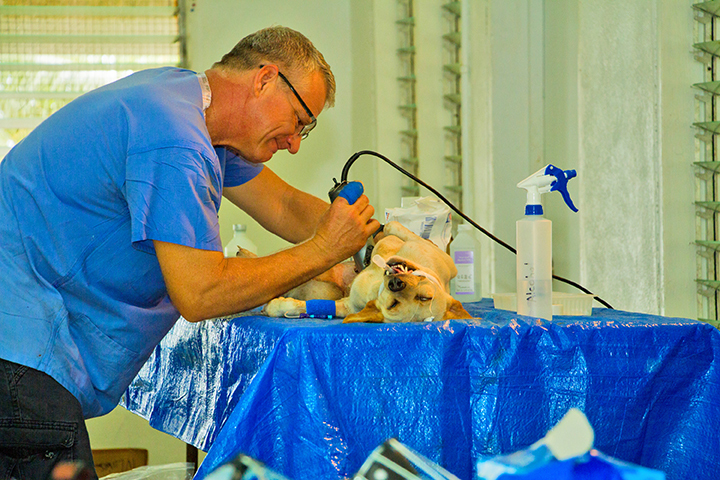 YAP, FSM — Two U.S. Army veterinarians and an animal care specialist conducted surgeries on dogs and cats and shared knowledge and practices with local volunteers during Pacific Partnership 2018 in Yap, Federated States of Micronesia, March 26-29. Veterinarians Capt. 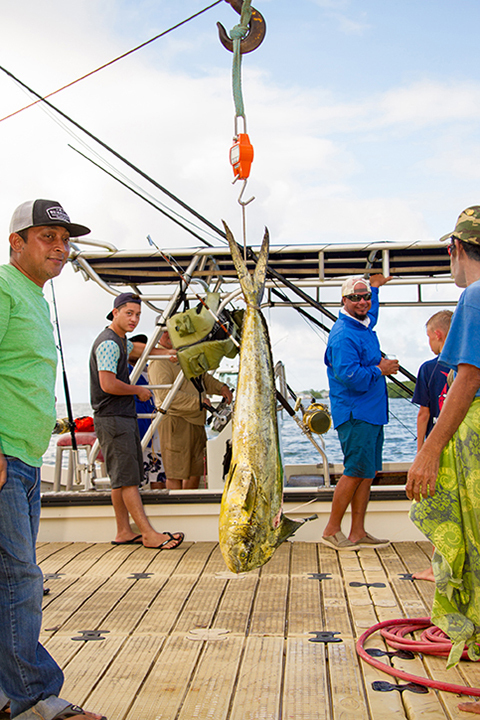 Adam Boe from Fort Shafter Hawaii, Capt. Trevor Tenney from Naval Base Yokosuka, and animal care specialist Spc. Diamond DeWindt from Kadena Air Base Okinawa provided vaccinations and conducted spay and neuter surgeries to nearly fifty animals. Prior to conducting surgeries on March 23, the three veterinarians met with volunteers from the Yap Animal Protection Society (YAPS) to discuss about basics of first aid, euthanizations, preventative medicine, zoonotic diseases, animal husbandry and other common animal diseases. As part of the Pacific Partnership 2018 mission to provide sustainable practices in Yap, the veterinarians shared knowledge to improve and increase efficiency of food production from chickens and pigs through discussions on nutrition, housing and medical care. The veterinarian team also participated in the Community Health Engagement (CHE) at the Yap Memorial Hospital as part of a team of more than 35 Sailors, Soldiers and Airmen from U.S., United Kingdom, Australia and Japan. “The most important aspect we, as visiting veterinarians, can do is to provide the necessary education to the local community about animal care so that the knowledge and experiences we share together during this year’s Pacific Partnership will last well into the future,” said Tenney. April 5, 2018—It’s been a rather long time since I heard good storytelling. I can recall when I was a small child, my grandmother would tell me old Pohnpeian stories/folktales. Usually each family at that time had someone who did that very well. Many of us children were very fond of that, and still are. Today I had a chance to relive a similar experience when I attended the storytelling of “Shipwreck’d on the Body Beautiful” by Daniel A. Kelin, II, author and actor of this play loosely based on the life of James F. O’Connell, The Tattooed Irish Sailor. He read and performed his play so well it got my imagination running. The descriptions of what O’Connell saw, tasted, felt—from the canoes in the Nahs, the mwaramwars, the festivities, the sakau—if you knew Pohnpei you would think to yourself, “Yep, that’s Pohnpei alright!”. It was all so beautifully written and wonderfully performed. Like our elders did while storytelling, Kelin went into character and played each role so well. With distinctive dialogue, singing and a bit of dancing, he brought the story to life. It was phenomenal and it made me realize just how much I missed our good ole storytelling by our elders. It made me wonder if there are Pohnpeians still carrying on that tradition, because we should. It’s been a form of art and history all together and if done well, storytelling is something everyone can enjoy regardless of our ages. The plot of the story was indeed the best part of this piece for me. From the scene where it all started, to the usual rejection of foreigners, the struggles of adapting to a new culture, and finally a love dilemma—it seemed almost fully fictional like a good Hollywood movie. Perhaps some of it was, or maybe just exaggerated a bit but all in the name of entertainment. Still, it holds enough truth to conclude that maybe James F. O’Connell really was here in Pohnpei and not only witnessed its exotic beauty in every aspect, but perhaps he even loved it. One truth that I personally agreed with in the piece was the most repeated line that read, “Those civilized might take a lesson from the humanity of these people to the shipwrecked.” If you’ve been in Pohnpei long enough, you know exactly what that means. YAP, Federated States of Micronesia (NNS) -- The Pacific Partnership 2018 medical team from the U.S., United Kingdom and Japan began the first of more than a dozen health engagements in Yap, Federated States of Micronesia at Nimgil Clinic and Yap Memorial Hospital, March 22-23. 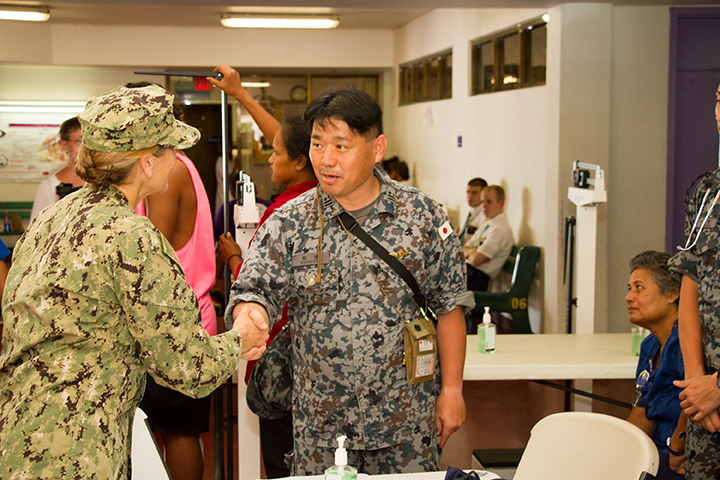 More than 35 Sailors, Soldiers and Airmen from the three partner nations provided medical and dental care to nearly 60 patients at Nimgil Clinic and more than 100 patients at Yap Memorial Hospital. Dental care included tooth extractions and fillings, and medical care included health screenings, audiology screenings, prescription eye glasses, advanced nursing education, veterinary education and home pet care. "I haven't seen this many people at our [Nimgil] clinic before," said Philip Ranganbay, community health center operations manager. "This was the first time some people listened to a brass band, and we are very appreciative of the support provided by the Pacific Partnership medical team." The Pacific Fleet "Deep Six" brass band consisting of five U.S. Navy Sailors and a drummer from the Royal Australian Navy performed at both medical centers, providing musical entertainment for patients waiting to be seen by the medical staff. The medical team at the Cooperative Health Engagement (CHE) at Yap Memorial Hospital included audiologists, veterinarians, primary care physicians, medical technicians, dentists, dental technicians and nurses. "I conducted dental screenings for 30 patients," said Japanese Ground Self-Defense Force 1st Lt. Shimoyama Daiji. "This is my first time in Yap, and I am enjoying the time interacting and helping the local people here on the island." The Pacific Partnership 2018 team includes five staff members from the Japanese Air, Maritime and Ground Self-Defense Force, and a combat medical technician (CMT) and medical assistant petty officer from the United Kingdom's Royal Navy and Army, respectively. The medical team provided health screenings to nearly 130 patients, dental care to over 70 patients and optometry support to over 60 patients. Health screenings included blood-glucose, vital signs and height-weight measurements as well as pediatric screenings. "There are no optometrists on the island of Yap, and patients were asking when we were coming back" said Lt. Kaiser Sultaini, optometrist for Pacific Partnership 2018. "It was absolutely amazing to be able to help the community by providing prescription eye glasses." "The medical engagements were collaborative and cooperative with host-nation medical professionals at the hospital," said Cmdr. Jason Blitz, medical lead for Pacific Partnership 2018. "We worked side-by-side with the host nation nurses and technicians at every step." Since 2006, the Pacific Partnership mission has provided medical care to more than 300,000 patients, veterinary services to nearly 40,000 animals and completed nearly 200 engineering projects while building meaningful and close partnerships throughout the region. YAP, FSM — Two U.S. Navy nurses from the Pacific Partnership 2018 medical team conducted the first-certified Advanced Cardiac Life Support (ACLS) course at Yap Memorial Hospital in Yap, Federated States of Micronesia, 26-27 March. Cmdr. Chris Jack from Naval Medical Center San Diego and Lt. Cmdr. Joe Pinon from Naval Hospital Camp Pendleton conducted American Heart Association (AHA)-certified ACLS courses to twelve nurses from the Yap Memorial Hospital designed to establish a standardized life support program in Yap. Both Navy nurses also conducted Basic Life Support (BLS) courses on March 22 and 28 to twelve nurses during four classroom sessions lasting sixteen hours that culminated with demonstration of motor skills and written tests. The BLS course serves as an introductory course focused on resuscitation without medication or advanced equipment. 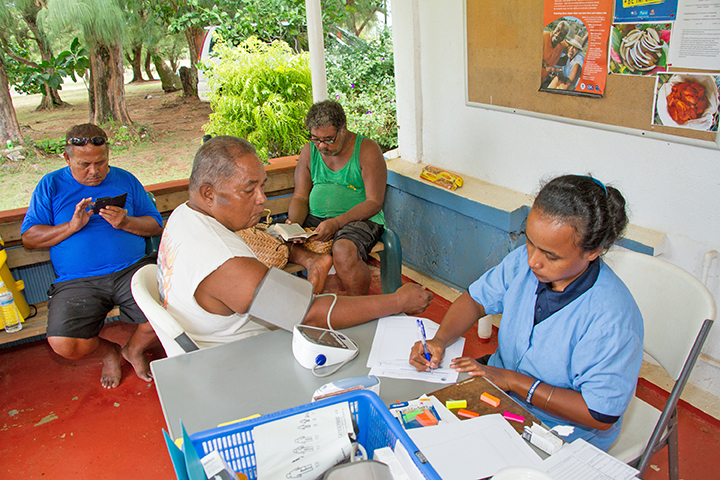 As part of the mission to provide sustainable practices in Yap, the Pacific Partnership medical team continues to focus on establishing recognizable guidelines that assist in developing medical programs that will last well into the future. 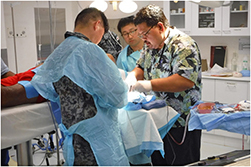 Currently, nearly 36 BLS-qualified medical professionals reside in Yap through a civilian-led life support program in Guam. “The goal is to continue sharing our knowledge and experience in life support throughout the medical community in Yap,” said Pinon. Both nurses are part of a team of more than 35 Sailors, Soldiers and Airmen serving as audiologists, veterinarians, primary care physicians, medical technicians, dentists, dental technicians and nurses from the U.S., United Kingdom, Australia and Japan. YAP, FSM — Seabees supporting Pacific Partnership 2018 (PP18) completed a series of engineering projects during the mission stop in Yap, Federated States of Micronesia, March 21-31. Twenty-eight Seabees, from Amphibious Construction Battalion 1 in Coronado, Calif., worked alongside the community at six construction projects spread throughout the island. 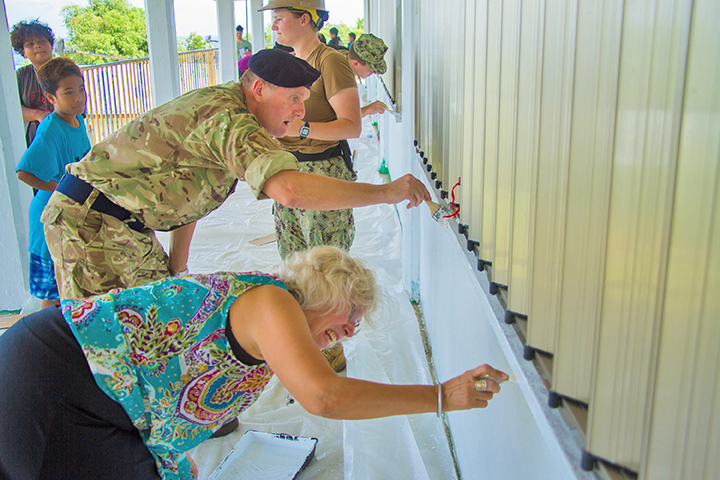 First, at Yap Memorial Hospital, PP18 Seabees and volunteers built three new roofs over medical storage containers, installed an interior wall with a lockable door inside one container, and built a six-foot addition to the oxygen storage building. Simultaneously, Gilman elementary school received a fresh coat of paint on the exterior walls, various doors and screen windows were repaired or replaced, and the school’s water storage tank had plumbing repair and a spigot installation. At the nearby Gilman Early Childhood [Education] Center, PP18 Seabees and volunteers painted the entire exterior of the school building and the roof. Then, at the Gaanelay elementary school, two buildings received a fresh coat of paint, and various doors were repaired or replaced. Dalipebinaw elementary school also got two buildings painted and brackets were replaced on the second story’s water drainage PVC pipe. Fanif elementary school had suffered eroded flooring and doors due to adverse weather conditions, and PP18 participants worked to prevent further damage as well as provided a fresh coat of paint to the building’s exterior. Finally, Tamilang elementary school received cosmetic improvements in the form of fresh paint and repairs to two stairwell doors. 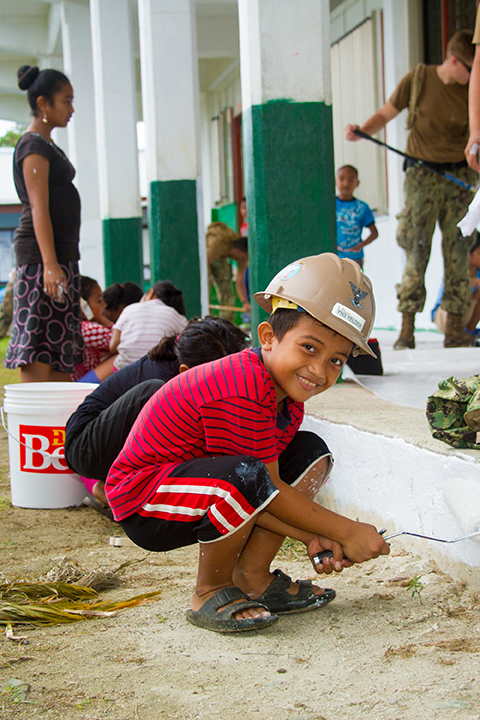 Joining the Seabees every day were volunteers from the ship, lending a hand to painting and minor carpentry work. The community also joined the PP18 participants, with more than 40 young volunteers from the schools showing up in force to paint over the course of the projects. Lt. j.g. Kelvin Edmonds, officer in charge of the ACB 1 engineering element supporting PP18, praised the efforts of his team. Edmonds noted the scope of the work was challenging yet rewarding. Deputy Mission Commander of PP18, Royal Navy Capt. Peter Olive, echoed Edmond’s words during a visit to the hospital site. “I’m very appreciative of all the effort they put in. It’s not lost on me that they’re the first folks out in the morning and the last folks to come back to the ship in the evening. When I talk to the people of the schools being transformed or the hospital, this work is changing their lives,” he said. WASHINGTON – U.S. and Federated States of Micronesia officials met in San Francisco this week for their mid-year meetings to discuss financial assistance provided for the benefit of the people of the Federated States of Micronesia on behalf of the people and government of the United States. The bilateral Joint Economic Management Committee (JEMCO) and the Compact Trust Fund Committee for the People of the Federated States of Micronesia are both chaired by U.S. Department of the Interior Office of Insular Affairs Director Nikolao Pula. The JEMCO met to discuss policy issues and progress in the health, education, and infrastructure sectors as funded by the Compact, while the Trust Fund Committee met to review trust fund investments and discuss policy options to inform transition from direct grants to trust fund distributions after 2023. The Compact Trust Fund was established under U.S. Public Law 108-188 to contribute to the economic advancement and long-term budgetary self-reliance of the people of the Federated States of Micronesia when annual grant assistance under the Compact expires after fiscal year 2023. Pohnpei State Government officials present at the meeting provided information regarding record rainfall in Pohnpei on March 16 and 17 that led to several landslides and damaged roads around the island, taking the life of one young woman. 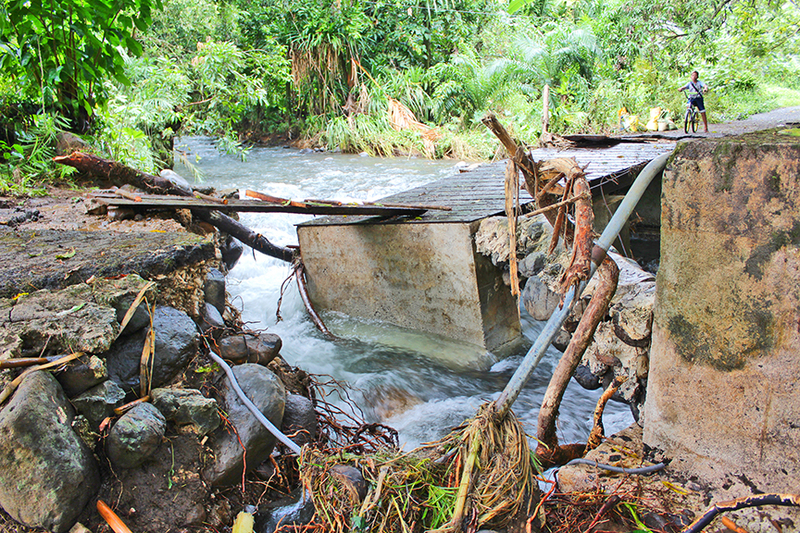 The JEMCO encouraged FSM officials to explore accessing the use of funding that is immediately available to the FSM through its Disaster Assistance Emergency Fund. This Fund is co-financed by annual deposits of Compact of Free Association and FSM Government funding. “With respect to infrastructure, we are pleased to see professional project management at the national level and encourage that trend to continue for the states as well,” said JEMCO Chair and OIA Director Nik Pula. “Continued delays in effectively utilizing infrastructure assistance made available through the Compact of Free Association are missed opportunities for development in the Federated States of Micronesia,” continued Pula. The JEMCO members discussed efforts at the state and national Departments of Education to strengthen their school accreditation processes and policies. The committee also received updates on the status of a nearly completed Education Management Information System (EMIS), a collaborative project funded by U.S. Department of Education supplemental education grants and supported by technical assistance through the Asian Development Bank. 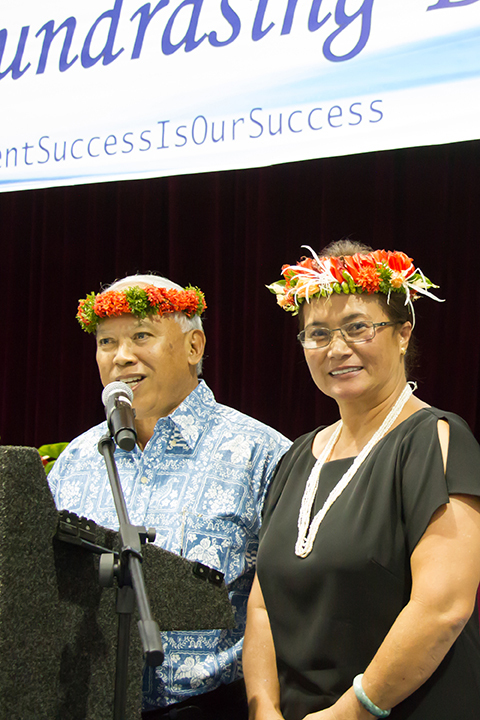 “We strive ultimately for improved data management and analysis of education indicators to result in improved educational outcomes for children in the Federated States of Micronesia,” said Chairman Pula. Leadership from the national and Yap State Departments of Health shared information on progress in bringing electronic health record keeping to hospitals and clinics across the Federated States of Micronesia. Development of this program is 80 per cent completed in the State of Pohnpei which also serves as a pilot for a telehealth program. It is hoped that successful efforts in electronic record keeping and telemedicine can be replicated in the States of Chuuk, Kosrae, and Yap. As required under the Compact of Free Association, U.S. Public Law 108-188, the JEMCO serves to ensure effective oversight of U.S. assistance to the Federated States of Micronesia and is comprised of the following members: Chairman Nikolao Pula (U.S. – Director, Office of Insular Affairs, Department of the Interior), Vice Chairman Lorin Robert (FSM – Secretary of Foreign Affairs), Leo Falcam, Jr. (FSM– Chief of Staff, Office of the President), Nicholas Dean (U.S. – Director, Office of Australia, New Zealand & Pacific Island Affairs, Bureau of East Asian & Pacific Affairs, State Department), and Subroto Banerji (U.S. – Office of the Assistant Secretary for Health, Region 9, Department of Health and Human Services). These challenges aren’t stopping hard working high schools of the Yap Robo League. Students from five of Yap State’s high schools have been working to design, build, and operate complex robots constructed from simple parts, and will showcase their achievement in a public competition and science fair this May. The Yap Robo League was created by Habele, a volunteer driven, US based nonprofit, with deep ties and cultural fluency across Micronesia, in 2011. 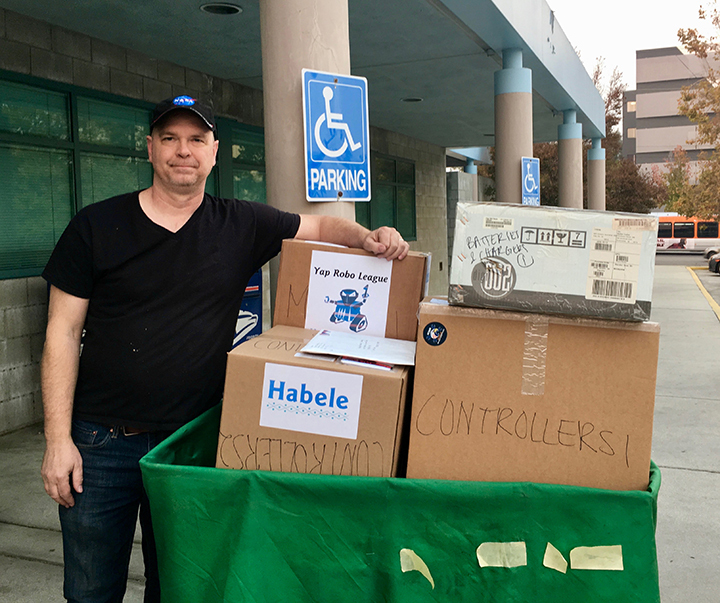 Established in 2006 by former Peace Corps Volunteers, Habele is heavily reliant on cash and in-kind donations, as well as gifts of time and talent, from individual American citizens. 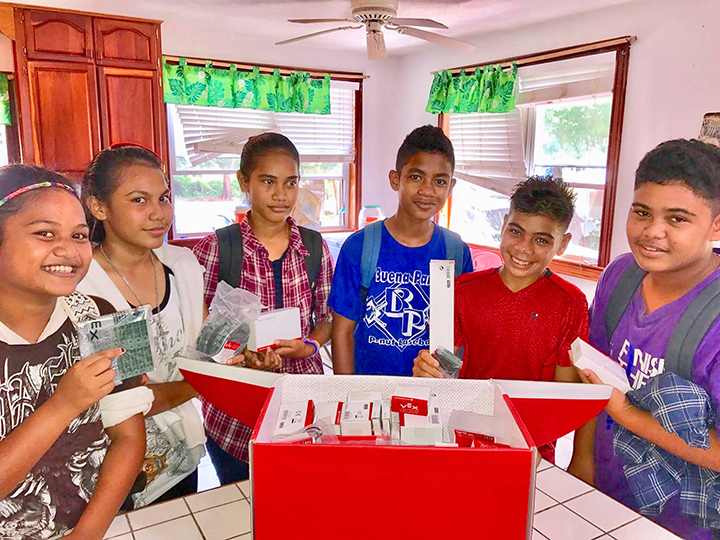 In 2017, the Office of Insular of Affairs, under the leadership of Douglas W. Domenech, Assistant Secretary for Insular Areas, invested in a pilot project to expand the league, growing this hands-on STEM program from two independent high schools to five public and private high schools across Yap State. “Habele’s work is founded on the recognition that publicity, competition, and consequences empower and sustain long term ownership and capacity,” explained Scott Leis, a former Peace Corps Volunteer and Habele’s CEO. Now, Deborah Weiss of the Habele's Special Projects Section is working with Teresa Filepin, Director of Yap State's Department of Education, and the staff of all five participating high schools to plan the day long robotics exhibition in Colonia, scheduled for May 22, 2018. “We are all tremendously excited about the progress made by each team,” explained Michael Wiencek, Principal of Yap Catholic High School, one of the original Yap Robo teams, and which fielded the team that represented the Federated States of Micronesia at the First Global international robotics Olympics in Washington, DC last summer. 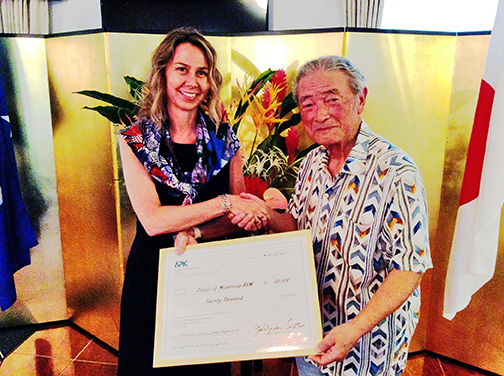 TOKYO, Japan – The Association for Promotion of International Cooperation has presented a check for $20,000 to the College of Micronesia-FSM to acquire learning resource materials for the college’s Kosrae Campus Learning Resource Center. Ambassador Sato recently led a delegation from Tokyo to Pohnpei, capital of the Federated States of Micronesia, which included Dr. Yoshiaki Terumichi, President of Sophia University in Tokyo; APIC Directors Yoshito Honda and Megumi Araki, who also serves as APIC Gecretary general; Chie Kato, Senior Associate Dean at Temple University Japan Campus (TUJ); and, Dr. Alistair Howard, Chief Academic Officer of TUJ. While on Pohnpei, Dr. Terumichi signed a Basic Agreement regarding Sophia University’s Entrance Examination for the Graduate School of Environmental Studies with the Micronesia Conservation Trust (MCT) and APIC to provide people in the Micronesian region with an opportunity to get higher education in the field of environmental studies. “APIC has played a key role in expanding Sophia University’s activities and role in the region,” Dr. Terumichi said. The event was co-hosted by two committees of the Kitti Municipal Government and the Pohnpei State Government organized by the Division of Social Affairs, and the Department of Health and Social Services due to the willingness of Kitti. The Kitti Agriculture Fair was also held in conjunction with the celebration. It was a well-organized event and was attended by a large crowd. Mr. Enerihko Peter humorous served as the Master of Ceremonies. 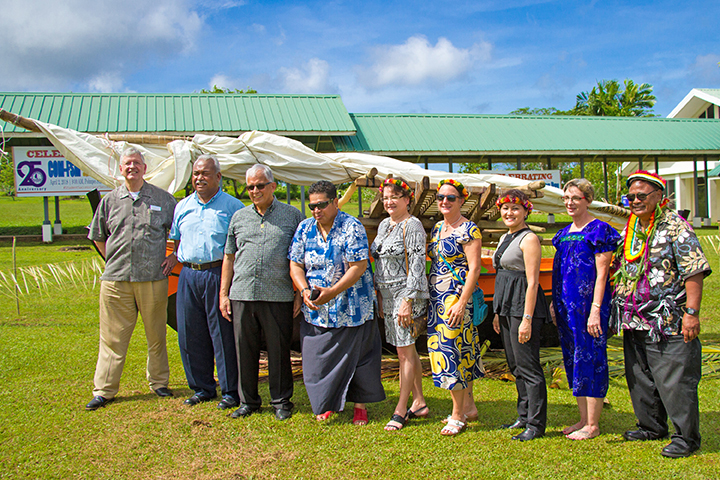 Distinguished guests included Pohnpei State Governor, Honorable Marcelo Peterson, FSM Congress Vice Speaker Senator Esmond Moses, State Senator McGarry Miguel, State Senator Dahker Daniel, the Australian Ambassador, the Acting Chinese Ambassador, and traditional leaders of Kitti. FSM President Peter Christian also briefly visited. Pohnpei—Extreme and continuous downpours over a two day period in Pohnpei led to flooding and multiple landslides over the weekend. Nearly two feet of rain fell during that time. Patrick Carl, the Chief of the newly formed Division of Fire and Emergency Services of the Department of Public Safety said that as of today they had been able to confirm 10 landslides but that there may have been more in areas that are still unreachable. He confirmed that several homes had been completely destroyed and that others were damaged to the point where they are unsafe to enter. 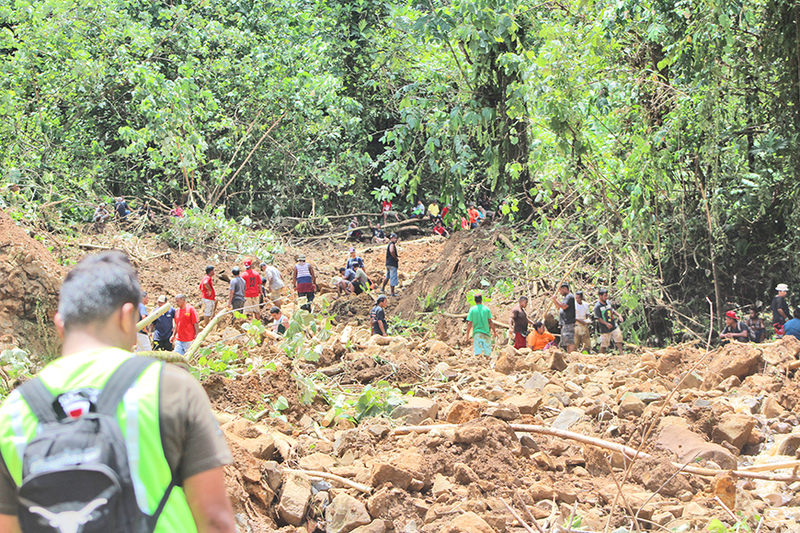 He also confirmed that as of today, the search for a woman in U who was buried in a landslide has continued without success but said that at the family’s request, the search would end on Wednesday if it had not been successful by that time. He said that the woman had been walking with her husband into the highlands to farm sakau when the landslide happened. The mud slide buried both of them but as it rushed down the hill, it brought the man back up closer to the surface. He was rescued and hospitalized. Unfortunately, his wife was apparently buried. The search for her began as soon as it was safe to do so. Early rumors that one of their children had also been lost in the slide proved to be unfounded. 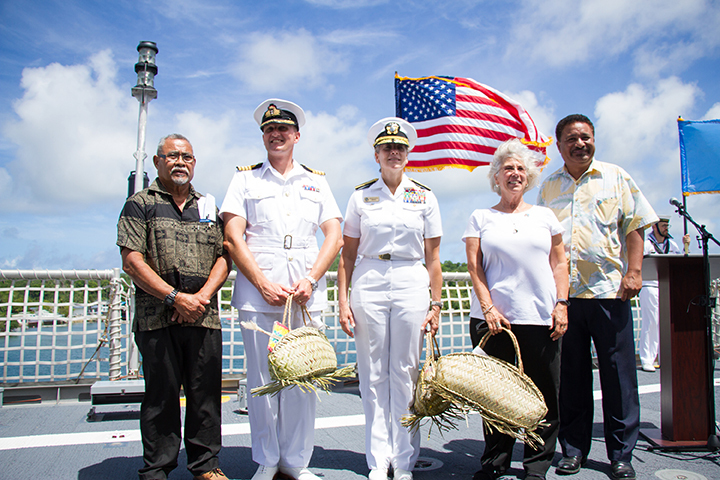 Colonia, Yap—Dignitaries gathered aboard the USNS Brunswick at the Colonia Port this morning to officially kick off the Pacific Partnership 2018 services in Yap. US Ambassador to the FSM Robert Riley said that the Pacific Partnership began after the massive tsunami in Indonesia in 2004. On analysis it was decided that the United States could have had a faster response to the tragedy. They put into place the plans for the Pacific Partnership in order to improve capacity for disaster response, to build medical capacity in the Pacific region, and to serve people in need. 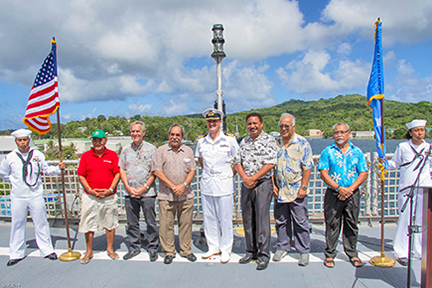 This year’s visit of the mission to Yap is the fifth time it is has visited the FSM since the Pacific Partnership began. The Pacific Partnership is a multi-national medical and humanitarian effort. As they continue on through the Pacific they will provide medical, dental, and opthalmological services, as well as veterinarian services and engineering services. They also will participate in good will community events like sporting events and concerts by the excellent brass band. Serving alongside US armed forces representatives are representatives of the armed forces of Australia, and Japan. The Deputy Mission Commander is Captain Peter Olive of the British Navy. Ambassador Riley said that while he was aboard the USNS Mercy on the previous day he’d also met people from Sri Lanka and Peru. The mission began with a visit of the massive medical ship, the USNS Mercy to Ulithi where they dropped medical supplies yesterday. The 1000 bed hospital ship with state of the art surgical theaters was simply too large to enter Colonia’s port. They dropped medical supplies that will be used by Pacific Partnership doctors that will be serving in the outer islands from their base aboard the Brunswick in Colonia. Pohnpei—US Ambassador Robert Riley and USDA Area Director Gary Bloom were at the Pohnpei Utilities Corporation’s Nanpohnman power plant to see the two new 545 kilowatt diesel generator sets using a USDA Rural Development High Energy Cost Grant. The $603,500 was awarded last year. PUC’s matching portion for the grant was $12,000. Installation is currently in progress by ABCOR which won the bid for the job. The units are scheduled to go online full time by April 14. The Caterpillar generators were purchased from Hawthorne, based in San Diego and with offices and shops in Honolulu and Guam. Parts for the generators can be ordered through the Guam office. PUC has a planned maintenance program for the generators based on engine hours. PUC told USDA that the units will increase the capacity of the power plant and will primarily be used for what they call “peak shaving”. They said that fuel savings can be realized when PUC can use the smaller units when daily energy demand does not require the bigger units to run. In addition to providing increased electrical power generation capacity, the units will allow for backup power generation capability when another generator needs to be taken off line for servicing. The units arrived on island last week and were transported to Nanpohnmal by Adams Brothers and ABCORP Engineering. PALIKIR, FSM — The Federated States of Micronesia has completed its Country Program for the Green Climate Fund and President Peter M. Christian has endorsed the document. FSM is the first Pacific country to submit a Country Program to the Green Climate Fund, and is now set to start developing its nationwide priority projects and begin accessing climate change financing from the Fund. The FSM Country Program has been in development since the inception workshop in November 2016. A final workshop to validate the ‘green growth’ oriented Country Program and its projects portfolio was held in August 2017 in Pohnpei State. The Country Program is an outcome of nationwide stakeholders’ engagement in addressing the FSM’s financing needs for resilient development. For the first time, FSM has a consolidated framework to develop large scale, cross-sectoral projects and programs which can transform its economy into a ‘green economy’ and make sure our communities thrive while adapting to climate change. The FSM is one of the 46 countries that have received GCF readiness grants to strengthen their engagement with the Fund. Upon finalization of its Country Program, the FSM joined Zambia, Antigua & Barbuda and Rwanda as one of only four countries in the world to have a country program that will maximize access to the largest climate fund in the world. With over USD 10 billion in pledges, the fund is almost twice the size of the Adaptation Fund, and three times larger than the Global Environmental Facility (GEF) trust funds. The FSM National Designated Authority Office for the GCF has recently conducted project development workshops in each of the FSM states and has a priority list of projects. 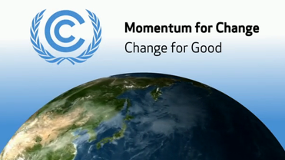 Accredited Entities to the Green Climate Fund will now be sought to further develop proposals and take the FSM closer to its climate change goals. FSM—The FSM Congress has introduced a bill (CB 20-116) that would purportedly guarantee representation of women in the FSM Congress. If passed it would mean another plebiscite vote to change the Constitution to redefine FSM Congress. The bill is currently being shopped around by the Congress Standing Committee on Justice and Governmental Operations in public hearings throughout the FSM. It is too early for the J&GO Committee to have made a report to Congress and more public hearings are scheduled and to be announced. According to the reactions of many people who have attended public hearings, the reaction to the proposed bill has been anything but positive. For some people, the very idea that seats need to be established on any basis to be filled exclusively by women presupposes that all of the other seats will be filled my males and is therefore an exclusionary measure of sorts. There has never been a woman elected for any seat in the FSM Congress but women are not precluded from running and winning a sit in the nation’s seat of legislative power. In August of 2012, Senator Isaac Figir who was then the Speaker of Congress proposed CB 17-147 which also proposed the addition of four new seats in Congress for women. That proposed bill is not available on the Congress website but The Kaselehlie Press published an interview with Speaker Figir about his bill which he first introduced as 15-169 in November of 2008. If either of his two bills had passed in Congress it would have meant a Constitutional referendum. Neither of his bills would have relegated the role of women who fill those seats to a non-voting status in Congress. The bill that is currently being considered was introduced by Speaker Wesley Simina on December 4, 2017. The heading said that it would be a “temporary special measure”. “…Stating that this measure is on the basis of ‘equality’? 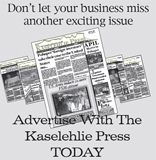 It makes my stomach turn,” one woman wrote in an email to The Kaselehlie Press. She said that she had emailed the Chairman of the J&GO Committee asking on behalf of the Pohnpei Women Council to be heard but received no reply. She said that she had also called and left what she categorized as a “ton” of messages but received no reply from that avenue either. “This is the most degrading, demeaning, discriminatory bill ever,” she wrote. 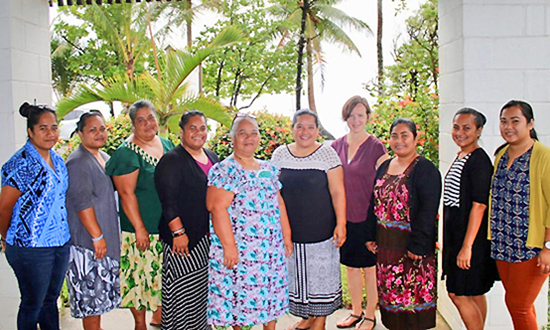 US Department of State-The U.S. Department of State, with the East-West Center (EWC) and the New Zealand Consulate of Hawai’i, has launched the second phase of the North Pacific Women’s Action Program, which will build a network of women leaders across the Federated States of Micronesia, the Republic of the Marshall Islands, and the Republic of Palau. The program engages established women leaders who are known for “getting things done” but are often not in the spotlight. The program launches with a four-day on-island workshop, during which participants learn and practice approaches for informed effective action around important community issues, and is then followed by a blended six-month Community Leadership Incubator. The goal of the North Pacific Women’s Action Program is to increase women’s participation in their communities and in local decision-making. The North Pacific Women’s Action Program workshop will take place in Kosrae on February 12-15 and in Yap on February 21-24. The workshops in Pohnpei and Chuuk took place in fall 2017. Some participants from the fall 2017 cohort will help facilitate the 2018 North Pacific Women’s Action Program workshops. This not only serves as an opportunity for women to share their knowledge and skills but also to engage at a community level and build a network to support advancing gender equality in the Federated States of Micronesia. We applaud the Pohnpei State Legislature’s unanimous passage of the Family Safety Act on November 17, 2017. We hope that some of the knowledge acquired from these capacity building workshops will support and enhance its implementation. In March 2018, the EWC will launch the Community Leadership Incubator, which takes an “online and on-island” approach by combining small cohorts on each island guided by an advisor, and the larger virtual cohort across all islands. Monthly meet-ups provide tools, strategy discussions and talks by inspirational women leaders from the region. Tools are then practiced and shared within Peer Learning Labs run by Incubator members, often in their organizations. Pohnpei—After a delay of a week due to weather, the WCPFC and Caroline Fisheries Corporation Kolonia Klassic Fishing tournament took place on March 10. 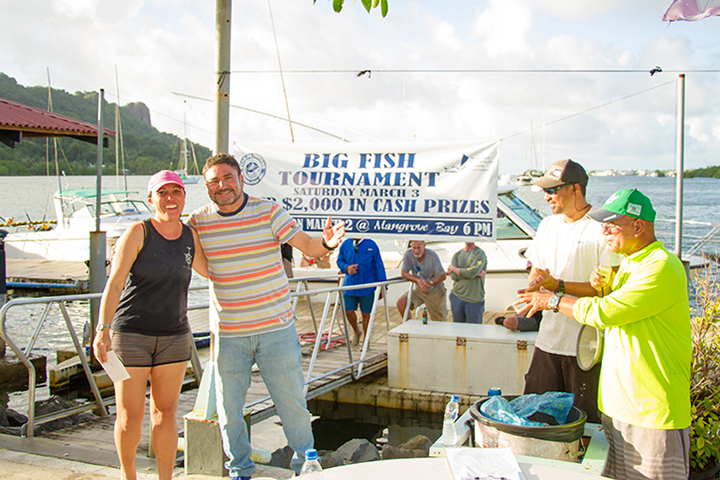 It was the first tournament for the Pohnpei Fishing Club for 2018. 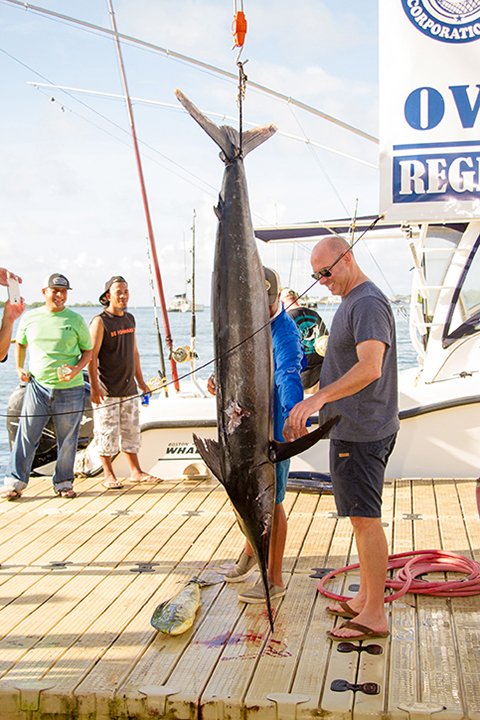 15 boats participated, and everyone was catching some fish. Many thanks to the Western and Central Pacific Fisheries Commission and Caroline Fisheries Corporation for their sponsorship. Improving school hygiene by providing a water gutter. Grant Item: Construction Cost for the wellness center. Improving the waste management system at Yap Recycling Program by procuring a 5ton forklift, a glass crusher and the training cost. The Hon. 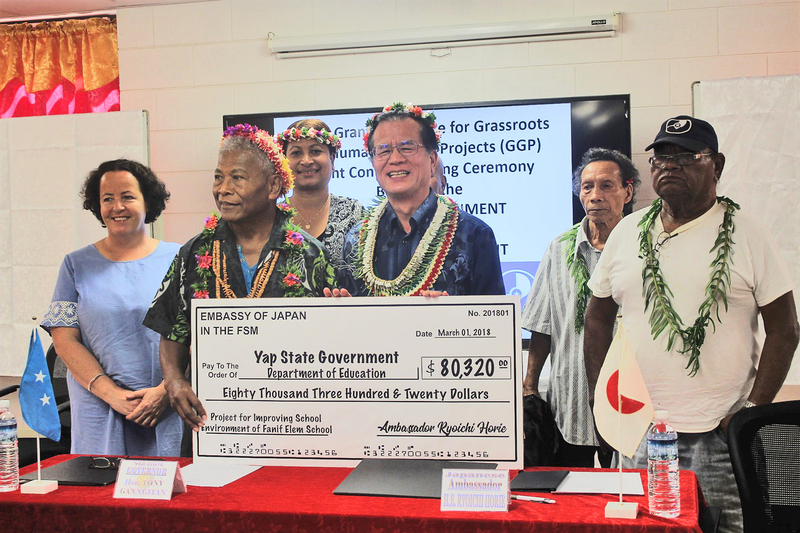 Tony Ganngiyan, Governor of Yap State, expressed his most appreciation for the continuous assistance from the Government of Japan, and explained the backgrounds and outlines of the three projects. He also stated that the Government will ensure that Ambassador’s stay during the 50th anniversary of Yap day will be worthwhile and enjoyable. In his address, Ambassador Horie stated that he was glad to sign three new projects as the embassy of Japan considers that the sectors related to those three projects (education, health and environment) are the most important sectors for the people of the FSM. 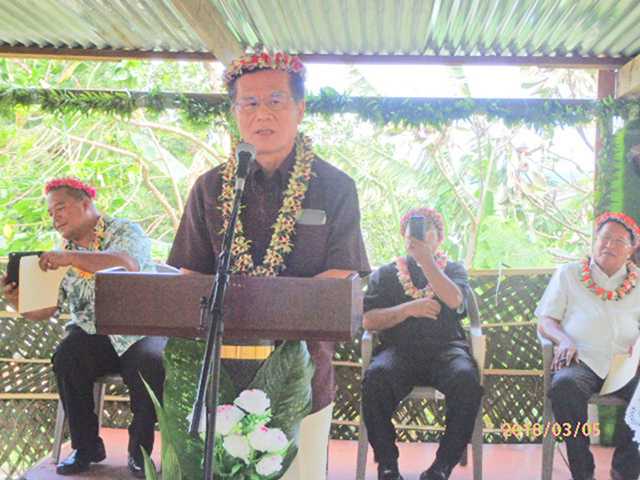 Also, he mentioned that he was impressed by the clean environment of Yap State after visiting all 4 states, and he encouraged Yap State to be a good example for the other states in terms of “Environmental protection” and “Recycling” by collaborating two past projects (construction of landfill and procurement of a PET Granulator) implemented by the embassy of Japan. The ceremony was witnessed by the Executive Director of Yap EPA Ms. Christina Fillmed, the Director of Department of Health Services Ms. Martina Reichhardt, the Director of Department of Education Ms. Teresa Filepin, the Director of Department of Youth & Civic Affairs Mr. Fancis Itimai, the Chief of Division of Media & Protocol Mr. Sebastian Tamagken, the Public Information Officer Mr. Joshua Libyan, staff of Yap State Government and staff of the Embassy of Japan. Pacific Partnership Public Affairs--Service members assigned to Military Sealift Command hospital ship USNS Mercy (T-AH 19) made a brief mission stop March 20 near Ulithi Atoll, which is part of the Caroline Islands in the Federated States of Micronesia (FSM). 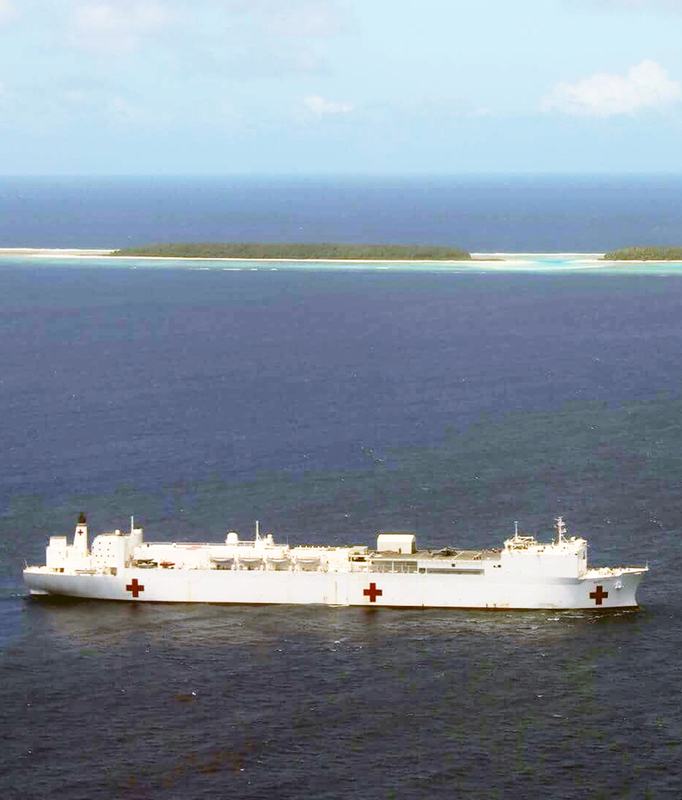 This is the first official engagement of Pacific Partnership 2018 (PP18), where the Mercy will be sailing near Ulithi Atoll and using helicopters to deliver medical supplies to a advanced echelon team of PP 18 medical professionals embarked on USNS Brunswick, the secondary mission platform, which will conducting a mission in FSM. PP18 medical professionals plan to work alongside Ulithi Atoll public health professionals, assisting in treating local citizens at a clinic. On March 19, 1945, Comfort-class hospital ship USS Mercy (AH 8) reported to the 5th Fleet at the Ulithi Atoll to assist the Okinawa campaign, during WWII. Throughout this campaign, USS Mercy made serval stops in Okinawa where they began embarking and treating patients despite the frequent air raids and kamikaze attacks. The Ulithi Atoll became one of the centralized points for the allies to treat patients and gather supplies for four months. For her service during WWII, the Mercy received two battle stars. Seventy-three years and one day after the USS Mercy made a stop in the Ulithi Atoll, USNS Mercy (T-AH 19), anchored near Ulithi Atoll. This feat was significant to many. During this mission, several government officials from the Federated States of Micronesia were flown onto the Mercy from the Ulithi Atoll, where they were given a tour of the ship and were able to meet Sailors stationed aboard the ship. Mercy, along with Military Sealift Command expeditionary fast transport ship USNS Brunswick (T-EPF 6), are participating in Pacific Partnership 2018 (PP18), the largest annual multinational humanitarian assistance and disaster relief (HA/DR) preparedness mission conducted in the Indo-Pacific. PP18’s objective is to enhance regional coordination in areas such as medical readiness and preparedness for man-made and natural disasters. Pacific Partnership 2018 consists of more than 800 U.S., partner and host nation personnel working side-by-side to better prepare for potential humanitarian aid and disaster response situations. Embassy of Japan--On March 10th, Ambassador Horie attended the JENESYS 2017 Certification Ceremony. 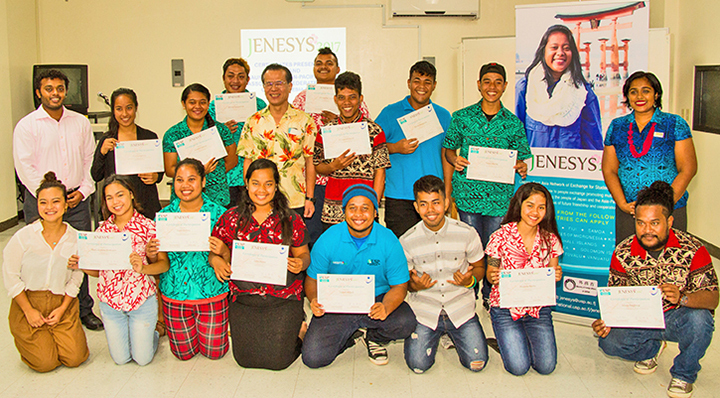 At the beginning of the ceremony, Ambassador Horie stated that JENESYS Programme (Japan-East Asia Network of Exchange for Students and Youth ) was created to promote “People-to-People Exchange” which is one of the main themes of PALM (Pacific Islands Leaders Meeting) and he was glad that twenty nine FSM students joined JENESYS 2017. He hoped that the program will be a good opportunity for students to get interested in Japan and the social and cultural exchanges between the FSM and Japan will become very active. Four participants reported their experiences in Japan with slides and videos. After participants got their certificate, the launch of Japan-Pacific Alumni Association was officially announced by Ms. Elisha Bano, JENESYS Project Coordinator, and Mr. Elvis Kumar, JENESYS Project Assistant. Two of them came from University of South Pacific in Fiji and also organized the ceremony. They encouraged participants to find ways to make use of their experience in Japan after coming back from Japan. The members of the Alumni Association plan to promote JENESYS Programme to students at COM in the future. JENESYS Programme was created for promoting understanding of Japan and youth exchange programs to build friendly relations and understanding of multi-cultures. The FSM students have participated in the JENESYS Programme for five years, and twenty-nine students, the biggest number, joined JENESYS 2017. The students were separated in 5 groups, which are “Building Peaceful Society, History”, “Disaster Prevention”, “Marine Resource”, “Trade / Investment and Tourism” and “Sports”. The participants visited Japan for nine days during November 2017 to January 2018. 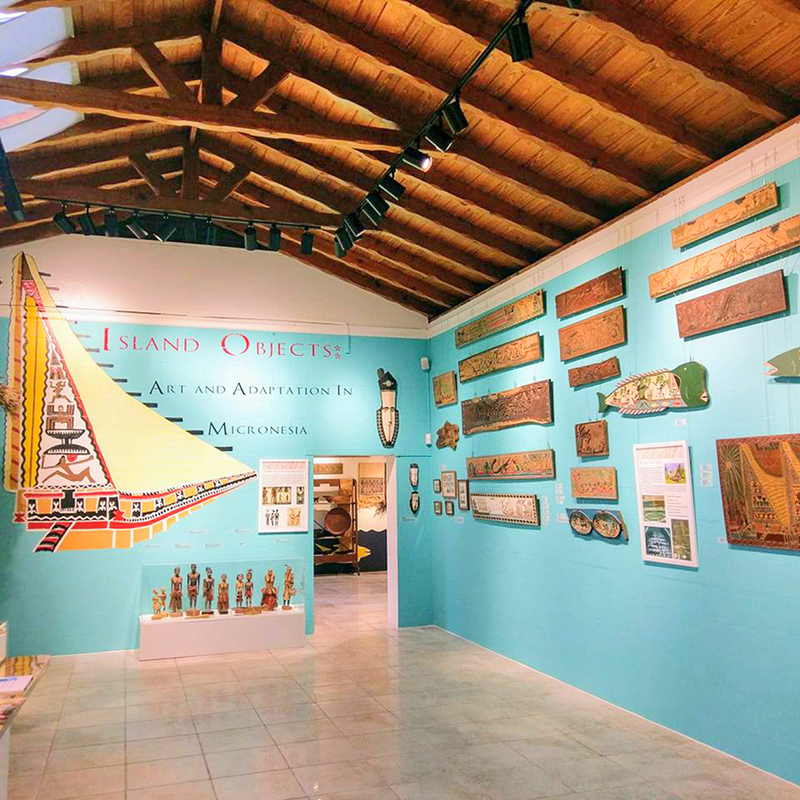 Habele Outer Island Education Fund--Twenty minutes northeast of Orlando, the Albin Polasek Museum in Winter Park Florida is hosting “Island Objects,” an exhibit of archaeological materials and historical items from the Pacific Islands of Micronesia. Wavell has also provided support and research for Waa’gey, a mentorship-based after school traditional skills program. Through hands on learning about carving and sailing, Waa'gey sustains centuries old traditions and imbues young men with a sense of accomplishment and belonging. 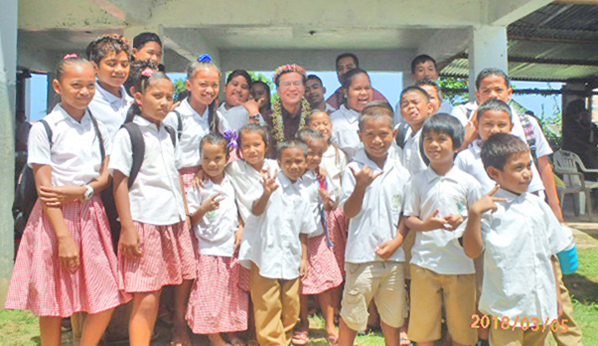 A Habele spinoff, Waa'gey serves at-risk students in Yap and Chuuk States, Micronesia. WASHINGTON – U.S. Interior Assistant Secretary - Insular and International Affairs Doug Domenech has authorized a payment of $653,003 to the Ninth Circuit Judicial Council Pacific Islands Committee to provide and oversee legal training for FY2018 in the judiciaries of the U.S. Territories of American Samoa, Guam, and the Northern Mariana Islands, as well as the freely associated states of Micronesia, Marshall Islands, and Palau. The Pacific Islands Committee of the Ninth Judicial Circuit was established to fulfill oversight responsibilities with respect to the judiciaries of the U.S. territories of American Samoa, Guam, the Commonwealth of the Northern Mariana Islands, and the former Trust Territories of the Federated States of Micronesia, the Republic of the Marshall Islands, and the Republic of Palau. All judiciaries in these Pacific Island jurisdictions are modelled after U.S. judicial system and the Pacific Islands Committee is charged with monitoring their judicial development. Specific responsibilities of the Pacific Islands Committee include: 1) assisting in the development and provision of continuing judicial education and court professional training and 2) overall improvement of the administration of justice in the courts. Support for judiciary systems in the U.S.-affiliated Pacific Islands began as early as 1976 when U.S. Supreme Court Chief Justice Warren Burger established a Pacific Territories Committee to develop and work with courts in the U.S.-affiliated Pacific areas, appointing Ninth Circuit Chief Judge Richard Chambers as Chair. The Pacific Islands Committee Judiciary Training program continues that work today. Funding is provided in part through the Technical Assistance Program of the Office of Insular Affairs in the Department of the Interior and through Compact of Free Association funding provided under U.S. Public Law 108-188. Employee benefits provided through the Prior Service Trust Fund represent a responsibility assumed by the Federal Government following the dissolution of the TTPI in 1986. The program serves beneficiaries with five years or more of prior service. The four jurisdictions to emerge from the TTPI were the Commonwealth of the Northern Mariana Islands, the Federated States of Micronesia, the Republic of the Marshall Islands, and the Republic of Palau. Leadership of these four jurisdictions continues to advocate strongly for the PSTF program. Beneficiaries receive monthly checks in varying amounts from $27 to $64 and have reported using them for medicine, food, utility payments, and telephone service to keep in touch with family. Today’s grant payment represents approximately half of the FY 2018 budget needs; the remaining balance is pending final action from Congress on the FY 2018 budget and is supported through the Technical Assistance Program of the Office of Insular Affairs in the Department of the Interior. On March 5, 2018, The Grant Contract Signing Ceremony was held at St. Cecilia School Yard for the Project for Procuring School bus to St. Cecilia School which provided the school with $31,830USD under Grant Assistance for Grass-roots Human Security Projects. The objectives of this project are to address the problem of student tardiness and to provide security for students by providing a school bus. Currently the school does not have school bus so that it takes more than one hour for some students to attend the school and when it rains heavily, it is very difficult for students to come to school on time due to the flood. Mr. Mondale Tim, the Special Assistant to Governor, Chuuk State, showed his gratitude for the generous assistance from the Government of Japan. He also stated that this project will provide security for students (to and from school) and improve the school enrollment. Mr. Anselmo Daniel, Chuuk ODA Coordinator, expressed his sincere appreciation to Ambassador Horie and the People of Japan for making this project happen and for continuing support to the FSM. In his address, Ambassador Horie, stated that the school bus which will be procured under this project will benefit the students of St. Cecilia School and hoped the vehicle will arrive early. The ceremony was witnessed by Mr. Angelino Rosokow, the Chief of Public Affairs Department of Administrative Service of the Chuuk State Government, Mr. Jessie William, the Chairman of the St. Cecilia School Administrative Board, the other board members, teachers and students and a staff of the Embassy of Japan in the FSM.